Hisar, Oct 11: Self-styled godman Rampal was on Thursday found guilty by a court in Hisar in two murder cases. Additional District and Sessions Judge, Hisar, D R Chaliya, held Rampal and some of his followers guilty in these cases. The quantum of punishment will be pronounced on October 16 and 17. 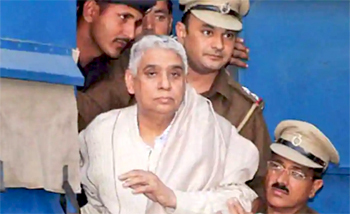 Rampal and 27 of his followers were charged with murder and wrongful confinement after four women and a child were found dead in his Satlok Ashram in Barwala town in Hisar on November 19, 2014. Thank God. Hope that all criminals would go to jail.